Even though some of us would like to think the bonds of love ought to be enough to bring two people together in matrimonial union, there needs to be someone present to witness the occasion for a marriage to be legally, and often religiously, recognized. Not just anyone can preside over the ceremony, however: you’ll need an officiant to lead the lovers through the rite of marriage, making sure everything is done correctly. Acting as a coach and referee, so to speak, an officiant helps a couple effortlessly cement their vows to one another while being their expert and legal representative to the state. An officiant is someone who performs a ceremony or service in either a religious or secular setting. Although these ceremonies can range from burials to bar mitzvahs, officiants are most widely known for their participation in weddings. In addition to overseeing and directing a wedding, these men and women have the task of signing and certifying a couple’s marriage license, which is then sent to the local courthouse or city hall. Religious officiants, which include a myriad of religious figures from priests to rabbis to imams, have been ordained by a religious organization and are granted the authority to preside over marriages, among other ceremonies like baptisms and funerals. On the other hand, secular officiants, sometimes called civil celebrants, have been appointed by a state or local government to legally conduct these ceremonies without being affiliated with a certain religious group. This makes officiant a good word to use when you want to describe the leading official of a ceremony without indicating any religious (or non-religious) sense. Other state officials, such as clerks, judges, and magistrates, are also considered officiants although their primary duties tend to focus on laws and records. Although some officiants, specifically those authorized by a religious institution, have to go through lengthy seminary programs to be ordained as a clergy member, a couple’s friends or family can easily apply online to receive a “One Day Marriage Designation” that allows them to solemnize a marriage on a specific date. 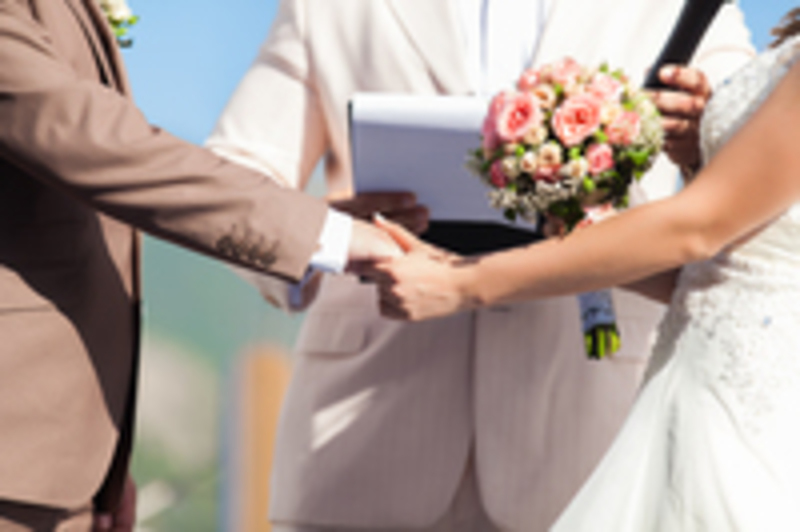 Whether you plan to get married by Father Joseph or your cousin Larry, all you need is to make sure he (or she) is a legal officiant before the knot is tied! Example: The reverend that married her parents agreed to be the officiant for her wedding. Example: They wanted a simple wedding, so they were married at the courthouse with a Justice of the Peace as their officiant. Officiate: This verb means to direct or govern over an event, such as a celebration or a ceremony. Example: The school teacher will officiate the preschool graduation. The key is to find out what your officiant does before he or she does it at your wedding. It's a top mistake - a highly regrettable one - to hire an officiant based on what a website says and shows. This is the person who will be leading the most important part of your wedding day! You don't want to be standing in front of all your loved ones on your Big Day with your jaw hanging open over a wacky officiant's unexpected... wackiness. Just like any interview process, it’s important that couples take the time to choose an officiant that will make them feel at ease on the day of the ceremony. Asking the right questions before a contract is signed is always the best way to ensure that an officiant will fit their needs and personality. Without seeing how the word is spelled, it’s easy to mistake officiant for the word efficient! Although it is proper usage and very common for people to pronounce the two very similarly, it is also acceptable, and helpful, to emphasize the first letter of each word, making them sound like oh-fficiant and eh-fficiant, respectively. Even so, listening closely to the context surrounding the word in question should definitely assist in the detective work. While you might read of an officiant doing or signing something, as such a person is wont to do, you’ll only hear efficient when it is used to describe someone or something as particularly productive. In more straightforward terms: officiant is a noun, while efficient is an adjective. In the rare case of an efficient officiant, you can be assured that you didn’t hear the same word twice: he or she would just be the facilitator of a rather speedy wedding ceremony. An officiant is proficient at weddings! An officiant makes a wedding official. Bring out the linguist in you! What is your own interpretation of officiant. Did you use officiant in a game? Provide an example sentence or a literary quote.